Lumpini is a large, beautiful park with a group of lakes, loads of palm trees, orchids and flowers. The park is closed to vehicle traffic, paved roads wind through the park for running and walking. Take a stroll, rent a mat for 20 BAHT, sit by a lake a read a book. There are food vendors inside and outside the park- grab a bowl of noodles. Or be active- run, join the group yoga or thai chi (start at 7am) classes, do some fan or sword dancing, high impact aerobics, tennis, swimming or just enjoy walking and talking away from the exhaust of cars. Or, take a paddle boat around one of the lakes. 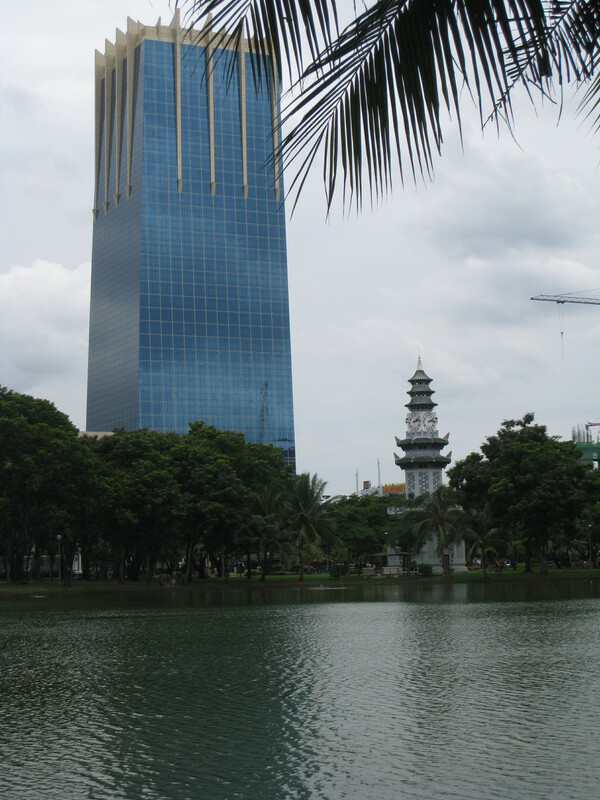 The park is accessible from any part of the city, almost a midway point between downtown (Sukhumvit) and Sathorn and the river. Go in the morning- before 8:00 to avoid the heat. If you are there before 8am, it will be 98% Thai people, they respect the sun and heat, want to get their activity in before the hottest part of the day. A good reason to be in Lumpini at 8:00- the national anthem. This is my favorite part of living in Bangkok, each day at 8:00 a.m. and 6:00 p.m. the national anthem is played on the radio, TV and loudspeakers throughout the city, including all city parks. At the bell tower in Lumpini sounds the eight bells in the morning, everyone stops, everyone. The traffic whistles stop, talking, running, walking and eating ceases. 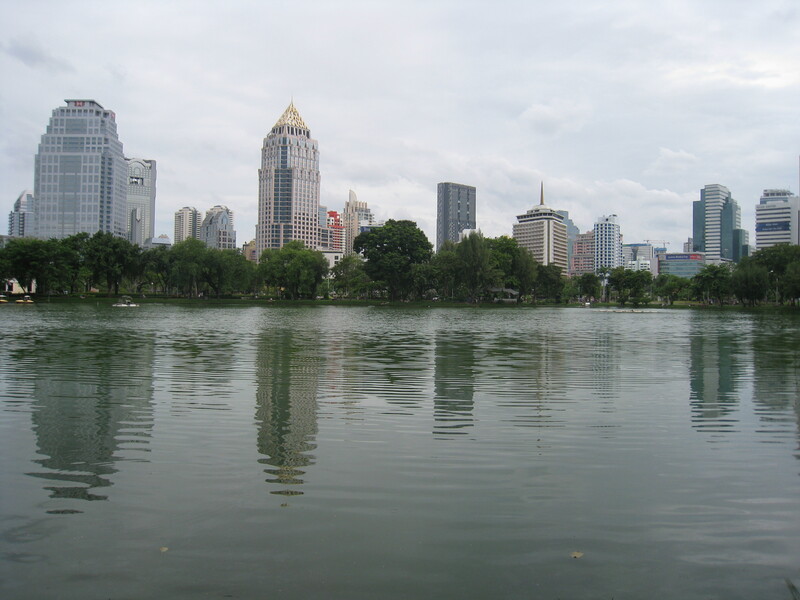 The bustling city with over 11 million people is in near silence. Amazing, especially after living in America where our national anthems and pledges are not universally known, sung or embraced. The Thai’s demonstration of national pride is enough to give one the chills, a must see. One group doesn’t stop during the national anthem. You can find this group if you walk by the lakes, look on the shore and in the water near the shore. What are you looking for? LIZARDS. Big lizards, BIG lizards. The lizards are an endless source of fascination, how do these lizards survive in the middle of a city with this many people. Yes, they are big, but they don’t approach people. Take a visit to Lumpini, you don’t need an agenda, just walk around, look at all the activity, be there for the national anthem, see the lizards, grab some noodles. 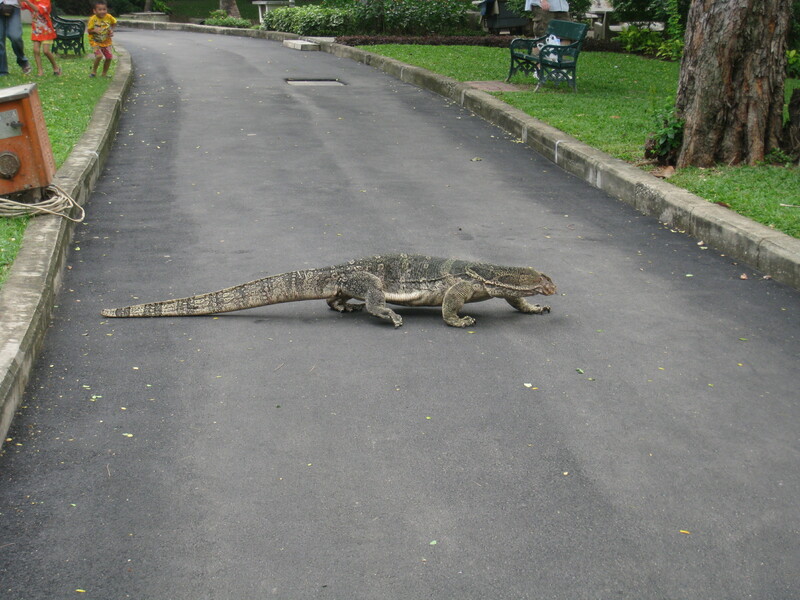 This entry was posted in Bangkok, Culture, Landmark, Sightseeing, Thailand and tagged Lizards, Lumpini Park. Bookmark the permalink. I enjoyed this post. I live near there and have now decided to go there this evening. Thanks for an enjoyable read. Wow, I’ve been living here for two months and I got word there are some massive lizards living here. I’ll go check them out right now! 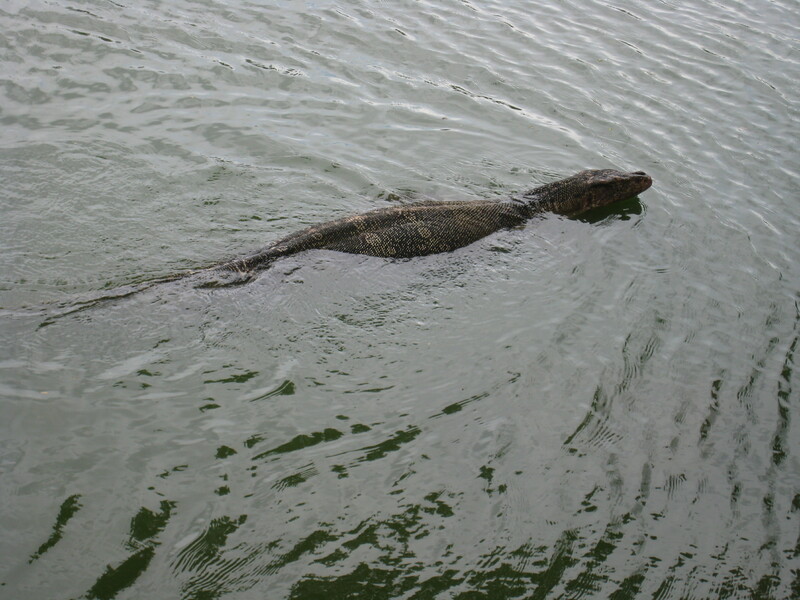 There are some big lizards in Lumpini, I was in the park last weekend around mid-day and saw 3 large ones. It’s fun to check them out, amazing to see lizards that size in the middle of the city.